Ram Gopal: F.I.R. means -- nobody is blameworthy! 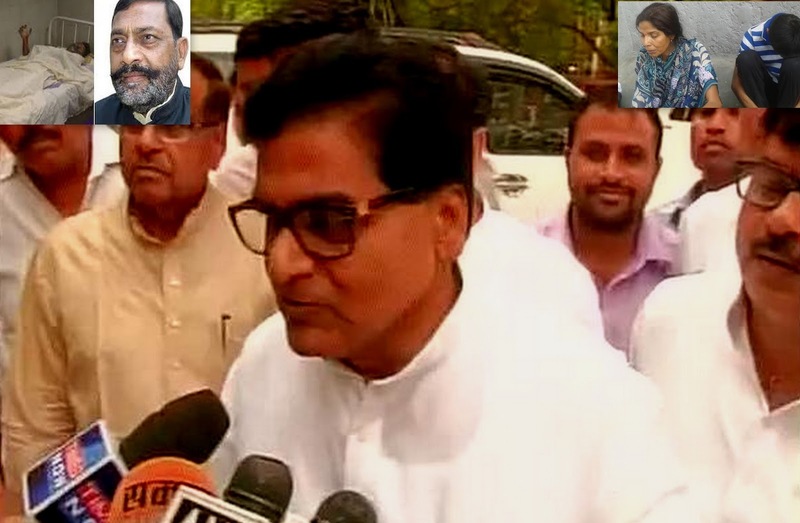 Mr.Ram Gopal Yadav, GENERAL SECRETARY Samajwadi Party, reacting with media persons, inset photos left the minister and right the bereft family. Samajwadi Party General Secretary, Ram GopalYadav, on Friday told here on the death of journalist in Shahjahanpur that the F.I.R. means -- nobody is blameworthy! The investigation is until in the run the Minister will hold the post. The police said that the inquiry against accused State Minister is ongoing; The evidence is being gathered; if it is needed the minister will be quizzed. IG Police (LAW AND ORDER), A. Satish Ganesh, told that the forensic teams from Muradabad and Lucknow today, reaching on the spot, picked up some evidence stuff and hoped the report may received in a week. He said, "The work of evidence collecting in primary stage is going on. Whenever the situations arrives during the investigation , the state minster will be questioned. The nominated inspector, Sri Prakash Rai, in the case has been removed and transferred to Jhansi." He added, on being informed the involvement of a few more policemen were identified. the names will be added in case dairy after their statements taken on records. it was informed that the bereft family was approached to tempt. if it is true, they can complaint to the S. P.